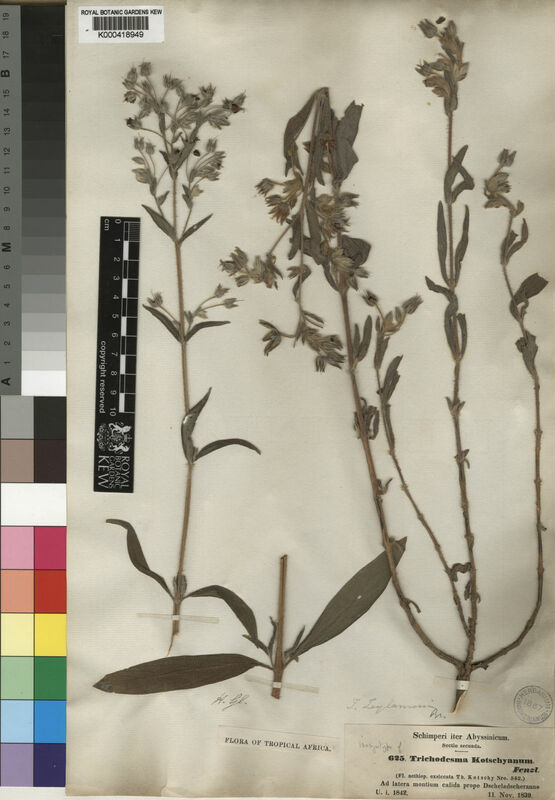 This species is accepted, and is native to Asia-Tropical, Africa and Yemen..
Perennial, less often annual, erect and usually branched herb or subshrubby herb 0.3–1.5(–2.1) m. tall from a taproot; stem ± woody at the base, densely pubescent and scabrid with tubercle-based hairs 1–2.5 mm. long. Upper leaves sessile, alternate, oblong to oblong-lanceolate, 2–12.5(–18) cm. long, 0.6–3.2(–5.5) cm. wide, narrowed to the apex, rounded to subcordate at the base, discolorous, scabrid with tubercle-based hairs above, the tubercles ringed with cystolith-cells, rough beneath, densely pubescent to grey-tomentose with tubercle-based hairs on the nerves; lower leaves opposite or subopposite, similar but larger, up to 16 cm. long, 5 cm. wide with a petiole 0.2–1 cm. long. Flowers drooping, in lax terminal many-flowered cymes; bracts similar to the leaves, 1.2–3.5 cm. long, 0.3–1 cm. wide, often cordate at the base; pedicels reddish, slender, 0.5–3.5 cm. long, with both short and long hairs. Calyx-lobes ovate-lanceolate, 7–10 mm. long, 3.2–3.5 mm. wide, enlarging in fruit to 1.6–2 cm. long, acute to acuminate at the apex, pubescent inside, grey-tomentose and with intermingled long tubercle-based hairs particularly on the midnerve and margins outside. Corolla pale to deep blue with white or pink to purple centre, with a dark reddish purple spot at the base of each lobe, or lobes white along mid-area and with blue outer areas and with reddish purple area below where the two blue areas join; tube funnel-shaped, 4–5 mm. long, glabrous outside, inside at the base on both sides of anther-insertions with cushions of scales; lobes 5–6, broadly ovate, 4–4.5 mm. long, 3.8–6 mm. wide, with an abrupt narrowly triangular acute twisted acumen 2.5–3 mm. long. Stamens sessile; anthers lanceolate, thecae 2.5 mm. long, with a tuft of hairs at the base and connective-appendages as long as the thecae or up to 4 mm., twisted together. Ovary 1.5–2 mm. diameter, glabrous, 4-lobed; style 6–8 mm. long, with obscurely subglobose stigma. Nutlets 4, grey marbled brown (? sometimes black), compressed ovoid, 4 mm. long, 3.2 mm. wide, the external face slightly convex, shining; internal face 3-angled, rugose and tuberculate. Figs. 26; 27/1, p. 96; 28/1, p. 98. Grassland, Commiphora, Grewia, etc., bushland, a common weed in old and new cultivations and a pioneer on disturbed ground, on both well-drained red loam and marshy ground on black cotton soil; 7–1710 m.
Annual with a tap root, or perhaps occasionally a short-lived perennial with a somewhat woody stock, with erect stems 0.3–1.5(2.0) cm. high, with ascending branches in the upper part; stems clothed with short spreading hairs interspersed with coarse tuberculate setae, or occasionally only with the tuberculate setae. Leaves (3)5–12(15) x 1–3(4) cm., narrowly elliptic, cuneate or occasionally rounded at the base, usually acute at the apex, sessile or subsessile, opposite or the uppermost alternate, the upper surface covered with tuberculate setae and sometimes with smaller hairs between them, the lower surface with tuberculate setae on the major veins and usually with a dense covering of smaller spreading or appressed hairs between them. Inflorescence 1–5 cm. long at flowering, elongating to up to 14 cm. in fruit, many-flowered, terminal on main and lateral branches, bracteate for most or all their length, the bracts ovate to lanceolate and rounded or subcordate at the base; pedicels 1–3 cm., densely clothed with conspicuous flexuous spreading hairs up to 2 mm. long and often also with minute spreading hairs. Sepals 7–10 x 2–3.5 mm. at flowering, enlarging to up to 20 x 6 mm. in fruit, ovate to lanceolate, rounded at the base, acute at the apex, densely clothed with long appressed or ascending hairs with those on the midrib and margins usually tending to be setose and more strongly tuberculate than the others. Corolla 7–9 mm. 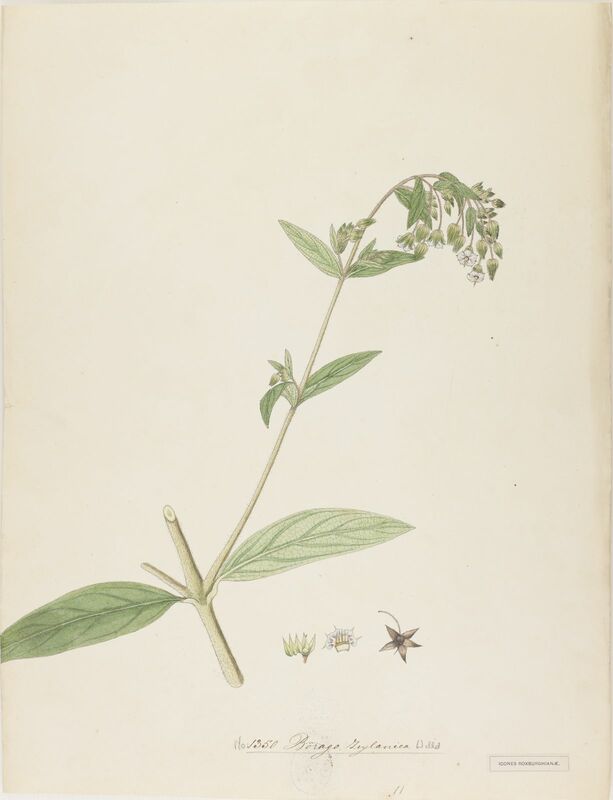 long, slightly shorter than to slightly longer than the sepals, the lobes broadly ovate-acuminate; lobes pale blue to lilac or pinkish, the tube often whitish between the lobes and with red to purple markings at its base. Fruit comprising four nutlets, falling separately to leave a pyramidal gynobase with four strongly concave sides, each with a more or less winged margin, and a persistent terminal style; nutlets 4–4.5 x 2.5–3.3 x 1–1.5 mm., compressed-ovoid, smooth and shiny and usually mottled with grey and brown on the outer surface, rugose on the inner surface. Fiji, Mauritius, Rodrigues, Réunion, Windward Is. Trichodesma zeylanicum var. latisepalum F.Muell. Trichodesma zeylanicum var. sericeum (Lindl.) Benth. Trichodesma kotschyanum Fenzl ex DC. Brummitt in Flora Zambesiaca 7(4): 95 (1990). Kabuye & Agnew in A.D.Q. Agnew, Upland Kenya Wild Flowers p. 520 (1974). Taton, Flore du Congo Belge, du Ruanda et du Burundi, Borag. : 37, map 12 (1971). Ivens, E. Afr. Weeds: 83, fig. 40 (1967). Cufod., Enumeratio Plantarum Aethiopiae Spermatophyta (Supplement in Bull. Jard. Bot. Brux.) p. 780 (1962). F. W. Andr., The Flowering Plants of the Sudan 3: 99 (1956). Brand in A. Engler, Das Pflanzenreich IV. 252 (78): 40, fig. 4/D–E (1921). Gürke & Vaupel in Wissenschaftliche Ergebnisse der Deutschen Zentral-Afrika-Expedition 1907-1908, 2 (Botanik) p. 280 (1911). Bak. & Wright in Flora of Tropical Africa 4(2): 51 (1905). Hook. in Bot. Mag. 80, t. 4820 (1854). A. Rich., Tent. Fl. Abyss. 2: 91 (1850). A.DC., Prodr. 10: 172 (1846). R. Br., Prodr. Fl. Nov. Holl: 496 (1810).